Finally, Vine has arrived on Apple Watch. Additionally, the latest iteration of this app brings about new iOS features that gives better video experience. With this recent update, it pushes up the app version to 4.4.0. 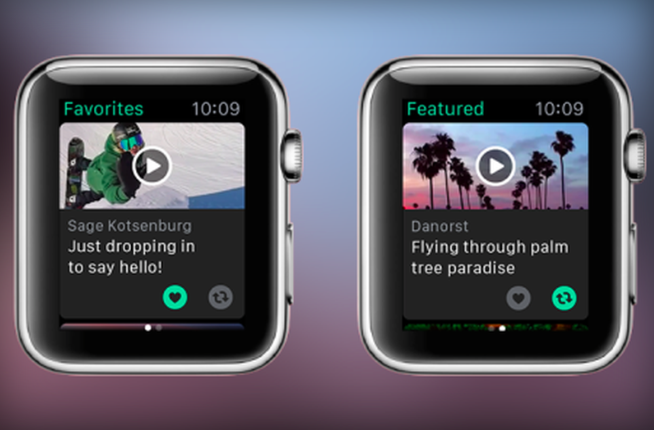 Now, you can play tiny videos from Vine on your Apple Watch. You can view content that creators have marked as Favorite and also view Vine videos from Featured categories such as Music, Comedy, Sports, and others. Additionally, it introduces a watch face feature that lets you determine your total account loops. This may be a bit obsessive but it is still better than keeping track on your wrist how many Twitter followers you already have. Vine can be accessed instantly from the watch face. An option to re-Vine is also available on the app. To get Vine on your Apple Watch, you simply need to download version 4.4.0 from the App Store. Afterwards, you have to open the Watch app on your iPhone, search for Vine, and enable Show App on Apple Watch. To add Vine’s watch face complication, you should long-press on the display and choose the watch face with said complication. Select “Customize” and under the options, select the area where you want to see the account loops and scroll through various options until you reach Vine. Vine brings on its latest update new audio and discovery features. It now has an audio remix feature that allows you to use other Vine audio tracks as your own. Simply select the More Button at the bottom of the video and then choose “Make an audio remix”. Select the music icon and see the track or sound information. Then, select the arrow at the top of the feed to see other remixes with same audio. On the iOS app, Vine brings a useful feature that lets you watch related videos much easier by simply swiping left. However, Vine did not explain how it determines which videos are related to each other. Still, you can keep on swiping left until you get bored.